Outlook: Weinstein says to look for “more than 100-percent growth YoY” in the ideation segment. If you thought collaboration was technology-centric, get ready for ideation. Where collaboration was about access to assets and display sharing, ideation is all about creativity and a continuation of the group-work process. All participants can annotate and manipulate visual content, and those iterations are saved for future retrieval and further markups in the next meeting. Now that the big players are into ideation, with Microsoft Surface Hub (pictured center), Google JamBoard (pictured top), and Cisco Smartboard joining long-standing ideation players like Prysm, Oblong (pictured bottom), and SMART Technologies, there’s a lot of market potential out there. In this edition of SCN’s “Fifteen Minutes with Ira Weinstein,” the senior analyst and partner at Wainhouse Research shares advice on how to tap into this nascent $1.5B-plus market. Yes, you read that correctly. 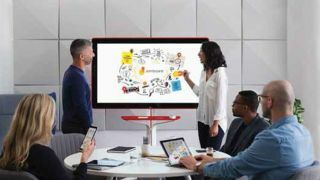 Now that the big players are into ideation, with Microsoft Surface Hub, Google JamBoard, and Cisco Smartboard joining long-standing players like Prysm, Oblong, and SMART Technologies, there’s a lot of market potential out there. SCN: Why do people need ideation technology in meeting rooms? Ira Weinstein: In most cases, meeting technology works best when it gets out of the way. The tools connect participants and then disappear. But success in ideation means the tools don’t disappear, you use them to take the discussion to the next level. Ideation solutions are an evolution of the analog tools we’ve used forever—flip charts and whiteboards. But the limitations are well known. If you’re not in the room, a whiteboard or flip chart really doesn’t help you. We’ve seen people point webcams and videoconferencing cameras at whiteboards, but how does the remote participant annotate that content? Secondly, once you’re done and you have to leave the room, the best you can do with a whiteboard is take a picture, and maybe send it someone. It doesn’t give everyone equal access to the information, and it doesn’t make it easy to continue the session where we left off. Third, dry erase boards and flip charts don’t let me bring other content assets, like documents and digital images, into the experience. Ideation solutions are technologies designed to empower people to ideate, to work together, collaborate, solve problems. Sometimes they’re used in a meeting room, with large displays and in some cases a wand-controller like Oblong, or other times from a PC or mobile device. But the most powerful systems, which we call the advanced ideation systems, also leverage the cloud to provide multi-location support, the ability to centrally store assets and resume the session later, etc. SCN: What is the business case for ideation? IW: We are very bullish on ideation. There is strong demand in the field, but deployments to date are limited. We expect more than 100-percent growth YoY in this segment—for the next few years. It’s not a new market, but it’s become more interesting as people become more globally distributed, and as they work in smaller, dynamic work teams, or they telecommute. Now savvy large enterprises are asking us how many large meeting rooms, standard rooms, huddle rooms, and ideation rooms they need. Ideation tools work together to generate value in these scenarios. In our research, we’ve found that a typical enterprise may or may not know about ideation solutions. So the first step for AV integrators and consultants is to educate the customer. Solutions are available in lots of different shapes, sizes, and price points. It used to be that ideation solutions cost $100,000 per room. But in recent years, prices have dropped significantly. In addition, many powerful ideation solutions are available on a per-user basis for just a few dollars per month. SCN: Where are people going to use ideation systems? IW: Unlike speakerphones, ideation systems are not likely to find their way into all—or even most—of a company’s meeting rooms. Companies have different needs; they might need 20, or 100, or even 500 ideation systems. It depends on the culture. It depends on how distributed their people are, and frankly, what they do for a living. People who work in automobile design or pharmaceuticals live and breathe around creativity and ideation. But other industries, perhaps real estate and the legal world, for example, are less dependent on the ideation process. SCN: So what are we selling here? IW: Ideation is a different experience. This is not a standard meeting experience. This is when your people need to work together to solve a problem, to brainstorm, to be creative together. This is an area where you must first gain a strong understanding of your customer’s needs. There are absolutely acceptable $2,000 and $80,000 solutions, and everything in between. Talk to your customer. Ask them: How many people will be using it? How many rooms? Do you need to manage it? Are they concerned about security? Are there guests (externals) who will be involved in these sessions? Tour their meeting rooms and look at what they’re using today. Ask them if their people are whiteboarding, flip-charting, trying to be creative and brainstorming together. How are they doing it today; which teams, departments, and locations are participating? And how close are these efforts to making you money—you have to ask that. Anything that empowers people to make money is money in the bank for system designers and integrators/ resellers. SCN: How will ideation change in the next six months? IW: First of all, the powerful marketing engines of heavyweights like Microsoft, Cisco, and Google, will continue to spread the word about the power and benefit of ideation solutions. Thanks to these ongoing efforts, six months from now, the number of people in the field who know about ideation will increase tremendously from today. We will also see additional use cases come to the table, new business models, and form factors. In addition, we expect vendors to increasingly leverage the cloud to add new features and functionality. SCN: What will the presence of major players in the ideation space bring to the AV channel? IW: These anchor vendors are validating this market segment. In addition, they’re making their products, services, and support packages available on a global basis. So channel partners around the world can now offer these products to their customers. This is a place where AV integrators and consultants can add value—not just by selling technology, but by performing needs assessments, choosing and integrating the proper solutions, and helping customers get the most of their investment. Training is a key element here to help users jump from the dry-erase board to the power of an ideation solution. But most of all, these are tools that make people money. New ideas result in new business offerings and new products and services. These tools enable the creation of new offerings. And perhaps most importantly, these are the tools that millennials expect to see in next-gen organizations. SCN readers can add value by helping their customers understand and leverage these next-gen tools.